A split system consists of an outdoor condenser that is connected to the indoor coil by a line set (see diagram). A/C condensers are for cooling-only applications. Heat pump condensers are designed for cooling applications in the summer and heating applications in the fall/winter. Choose between sweat or quick connect & pre-charged 13 SEER air conditioning condensers or heat pumps condensers. Estimate the A/C or heat pump system size by referring to an estimate or proposal from a local contractor, the size of your existing system that you wish to replace, or use our sizing estimation charts on our air conditioning or heat pump pages. The SEER or “Seasonal Energy Efficiency Ratio” is how condenser efficiency is rated. Choose between 13 SEER sweat or quick connect A/C or heat pump condensers. Note: Never oversize an air conditioner or heat pump system by more than 20%. Simply match your ton size with the multi-positional coils using the condenser specifications (SEER rating, system size, application). Select the coil that has a case width closest to the width of the furnace. Multi-positional coils can be used for all applications. Also see coil specifications on our 13 SEER Coils page. Select a line set that is long enough so the proper connections can be made from the outdoor condenser to the indoor coil. Line sets are available for sweat and quick connect & pre-charged applications. 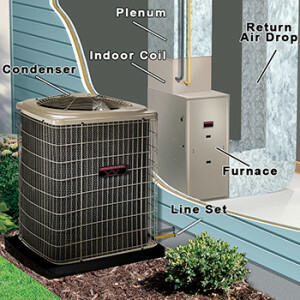 Air conditioners and heat pumps are both considered to be the condenser, and generally use the same line set. The indoor coil, due to technical differences, may need to be chosen based on the application. An air conditioning condenser pumps refrigerant into the indoor coil via the line set. The refrigerant enters the coil as liquid and evaporates as it enters. This process causes the indoor coil to cool down (30°F – 35°F). Air is then forced through the coil (via the furnace/air handler blower), creating cool air. This air is transported through the duct system into your home. A heat pump condenser works year round. It acts as an air conditioner during the cooling season and during the heating season supplies heat. It does this by reversing the flow of refrigerant to the indoor coil, causing the coil to heat instead of cool. Depending on your heating region, a heat pump functions either as a primary source of heat for the heating season or may act as the 1st stage of heat, working in combination with a furnace (2nd stage) which is used as a backup (emergency) heat source. When using heat pumps in combination with fossil fuel furnaces (i.e. natural gas, LP, oil) it is important to remember that most heat pumps are effective until outside temperatures reach 30° to 35° F. At this point a secondary source of heat is necessary, in order to heat your home during the coldest times. Therefore, a furnace/air handler may be required for the secondary stage of heat. Depending on the complete system, heat pumps can require the use of additional accessories such as fossil fuel kits and outdoor thermostats (when using natural gas, LP, or oil fired furnaces) to operate properly. Arrange for your own installation or for maximum installation savings, do all the non-technical preparation and have a certified technician perform the final connections, start-up and check test. All Federal, State and local Codes must be adhered to. Installation manuals and warranty information can be obtained from the product pages of this website, or by visiting our “Equipment Manuals” page.